Second edition of the Women in Science calendar is available for free download! Remember the Women in Science calendar from last year? We got a heartening response—it is the most popular page on this site, it was gifted to the President by the incoming Scientific Advisor to the government K VijayRaghavan and the free download link went viral on Whatsapp. So, we decided to create another one for the year 2019-2020. Just like last year, the calendar is unveiled today, 11th February, to mark the International Day for Girls and Women in Science. This is becoming an annual TLoS tradition! The calendar features 13 scientists—9 scientists we have interviewed during our 3-year-long labhopping journey and 3 other late scientists, for their contributions to Indian science. The calendar has been carefully curated to showcase the diversity in backgrounds and scientific fields that women in science in India represent. This time Suchi, illustrator and designer at The Little Big Things, has illustrated the pages of the calendar. The scientists and us, we are all excited for you to take a look and be inspired! We hope the colorful calendar will grace the desks of kids and adults alike. The calendar is available for free download. Click here for the digital copy. We also have a mobile friendly version of the PDF which you can download here. You could also use the individual pages as your mobile wallpaper! Download the images here. If you like it, share it with your family and friends. In case you want to have a physical copy, you can print the same digital copy at home from the link above. We are providing physical copies of the calendar as a reward for contributing towards season 4 of TLoS blogs. You can donate here. Aashima unveiled the calendar at an event celebrating International Day of Women and Girls in Science held at St Stephen’s College, Delhi. 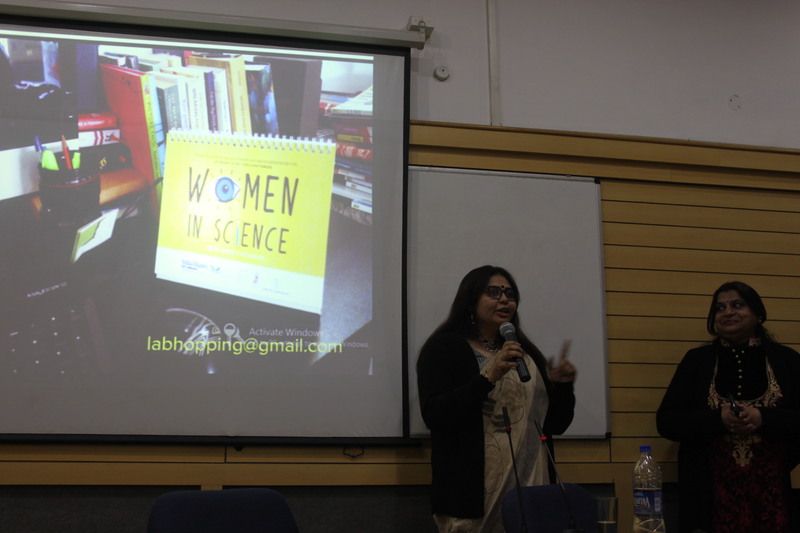 Three TLoS scientists Lipi Thukral, Nandini C Singh and Orus Ilyas talked about their scientific journeys at the event. The event was held in partnership with Wellcome Trust/DBT India Alliance. We are an independent project campaigning for gender equality in Indian science. Please support us on Patreon or write us an email if you would like to make a donation. This calendar was made possible with a grant received from Wellcome DBT Indian Alliance and anchorage from the Nature Science Initiative. We thank these partners for their continued support to the cause of Women in Science in India. Download our Women in Science calendar for free!